Michelle, LOVELY projects! Your Magnolia card is absolutely beautiful. Your mermaid tag is so sweet! Beautiful. The magnolia looks like it was just picked. I love your cards today... The flower is so pretty... and I always love those mermaids! I really like your background on the mermaid card. Thanks. Gorgeous cards. I especially like the soft colors on the magnolia, the new watercolors are pretty cool! These new watercolors by Hero Arts look like so much fun. Love your cards - thanks for sharing your talents. I love the clean and simple card for the first one! Thanks for the inspiration. You are so creative. I really love the magnolia stamp... I think it's my favorite! I love the elegance of this flower my flower very soon love ypur card. Michelle, your card is simply gorgeous and being as I am a tag fanatic, this one rings all my bells. Beautiful water colouring on it as well. I love the magnolia. Gorgeous! The blues on your mermaid tag are gorgeous. Thanks for sharing. You Magnolia card is Beautiful.And the mermaid card is Grand. I'm quite in love with the watercolors~I can hardly wait to start collecting. Beautiful colors. Love that magnolia. Magnolia is my fave. So many ways to color it. Loving the Flowering Magnolia, all the new Hero stuff is fantastic! Your designs are so lovely. I love the subtle colouring of the magnolia stamp and the mermaid tag is super cute. Great release! Love the softness of the flower. Your card is so gentle and beautiful! Clean and simple wins the day! 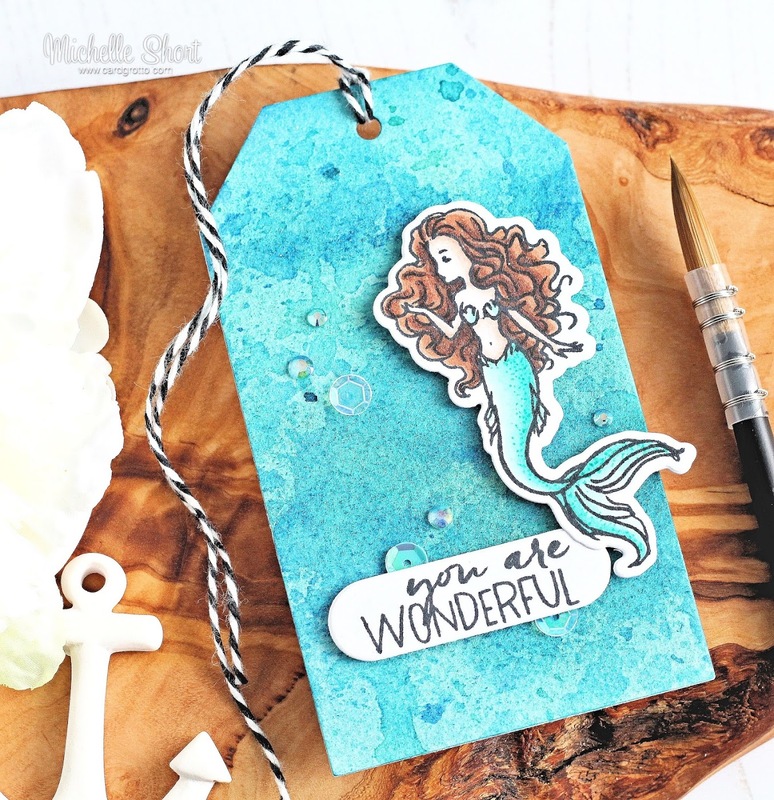 Your card is gorgeous and your mermaid tag is stunning! Great job! 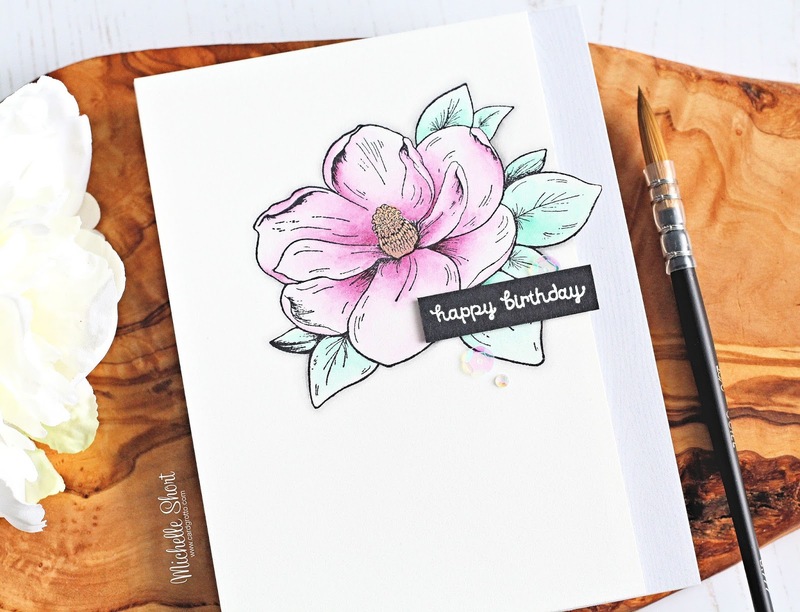 wonderful inspiration, Michelle - love how you achieved the soft shades in your magnolia with these new watercolors! I swear off wood-mounted stamps because I dont have the space but your card is so beautiful, I think I may HAVE to have it!!! Great cards! thank you for the video - it's so helpful to see your technique using these new watercolors! Love your projects. The first is simple but pretty with the soft coloring. Great job! I love Magnolia stamp. Thanks for the inspiration. Wonderful cards! 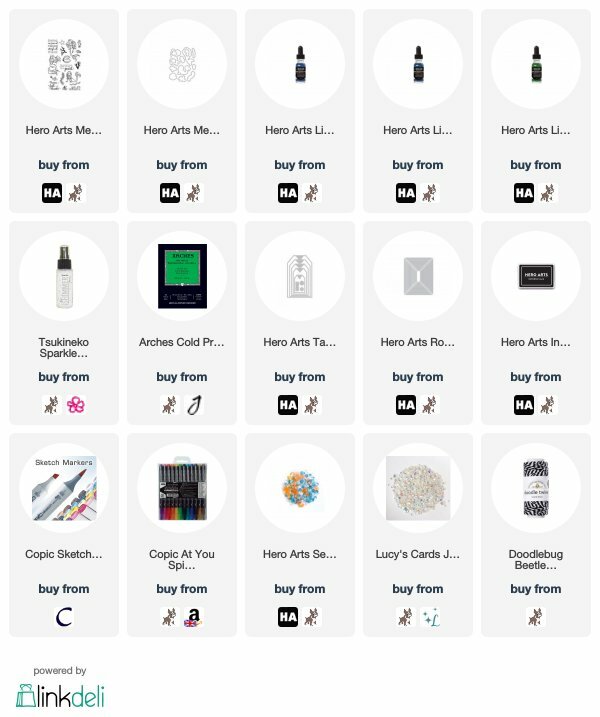 I think the new watercolors are going to sell out - they are on the top of my wish list, too! So pretty - love the soft colors on the magnolia and the mermaid is so sweet. Your flower card is so delicate looking. Perfect for spring. Also love the mermaid. Great cards! Beautiful card, just love that magnolia! The new stamps are amazing. I was unable to leave comments on some sites. The elephant stamps are awesome. Beautiful watercoloring! The magnolia is so pretty! Beautiful floral card and fabulous mermaid tag. That tag is adorable, and I love what you created with the magnolia stamp too! Two fabulous projects!! That first, the card, is so simple and gorgeous!! Love just the bit of color from the water colors. Love the flower and the tag. The tag is so bright . This magnolia is so beautiful! Your watercoloring is really inspiring. Love those stamps and watercolors. Beautiful card and tag. Love the way you have shown how to dilute it down to give a light look to the vibrant watercolors. Lovely cards, Michelle! The magnolia is CAS loveliness and the tag background is perfection behind that gorgeous mermaid! This is a great release! Love your card and tag. Beautiful card and tag--I especially love your lovely CAS magnolia card! Beautiful card and tag! I love your pretty coloring! Can't wait to try the Liquid Watercolors! I just got a SSS order with the tea time mice stamp set. I guess it's my favorite. I'm in love with the bunny and dying to try the watercolors. Lovely card, Michelle. What a lovely CAS card - that magnolia is just beautiful! Wow! Your creations are simply stunning!!! I love the beautiful simplicity of the magnolia card. It's gorgeous. Your tag is vibrant and beautiful, too! I love your card and tag! That magnolia blossom is gorgeous and I love the pale colors you used to color it, that makes it look so realistic! Thank you for sharing with us! I'm loving this sweet magnolia with just a hint of color and your gorgeous mermaid tag!! I am going to have to try cutting around a portion of a stamped image as you did with the gorgeous magnolia. Awesome tag background too! Those watercolors look really cool!! Lovely cards. The background behind the mermaid is beautiful. TFS. Loving those new watercolors. Beautiful ocean & mermaid tag. Michelle, once again you have produced a lovely card! 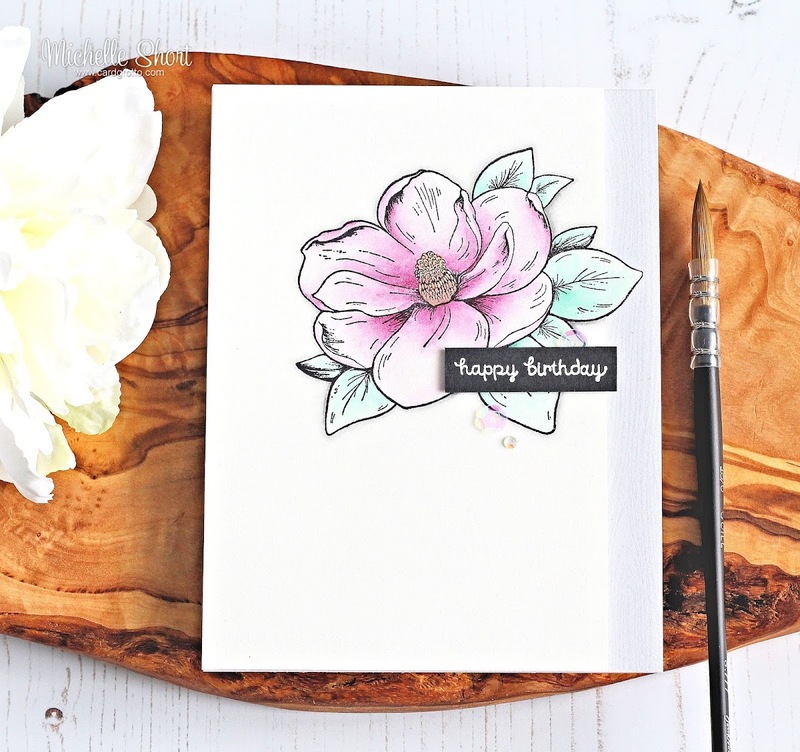 Both your card and tag are gorgeous and show the versatility of those watercolours. The background on the mermaid tag is so serene. I loved the colour blend. Thanks so much for sharing your tips and inspiring. Two wonderful projects. Your water coloring is beautiful. Love how the vibrant Liquid Watercolors dilute out so nicely to pale shades. Love the soft colors you used for the magnolia and don't get me started with mermaids lol. Thanks for the inspiration. Great projects! Love the soft colors on the flower and more vibrant colors on the mermaid tag! I love the soft water-colouring on the first card. Just stunning! Thank you for showing us the different options for the watercolors. So good to know they work for both soft and bold looks. And that magnolia stamp is rapidly becoming a favorite; it's just so gorgeous. Thanks for sharing! Nice soft look on card and love the colors used in the tag. 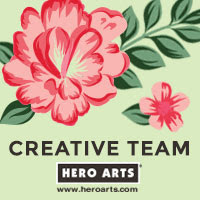 Love your cards and love Hero Arts! You showed one extreme to the other with the liquid watercolors making each so different from the other. 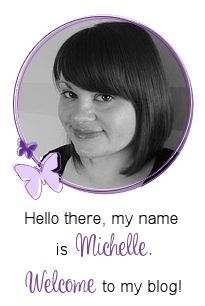 Thank you so much Michelle for sharing your beautiful work. I also love your post below for the video blog hop. I don't watercolor really and all 3 of these techniques are wonderful. I also learned about the major blog hop to help others! Thank you! The floral card is beautiful, and the background on the tag is just stunning. 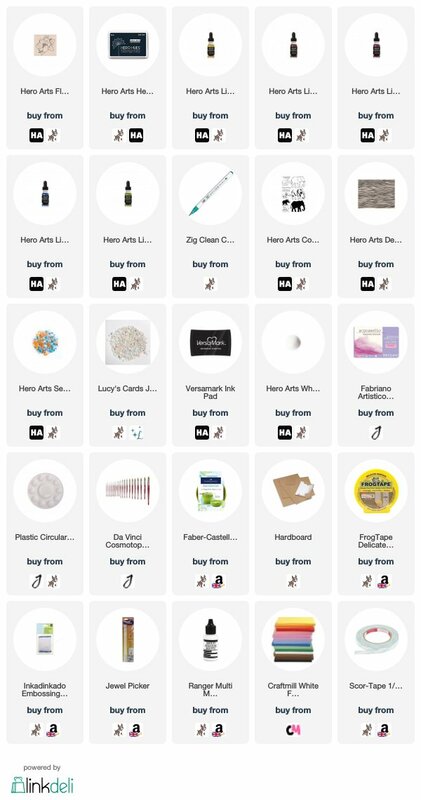 I really enjoy seeing what you create with Hero Arts products, Michelle. Love the subtle coloring on the gorgeous Magnolia stamp. The liquid watercolors produce such nice results. Wow Michelle the way you played with the liquid watercolors showed what a great artist you are. Thanks for these gorgeous examples! Love the lightness of your magnolia card. Gorgeous card & tag. I love the CAS look of your card and then the amazing background of your tag! So pretty! TFS! Wowza! Your work is lovely. The card and tag are beautiful. I will have to try the watercolors. Thanks for the inspiration. That magnolia is so pretty! Can't wit to get it. And love the mermaid tags! I'm very excited about those watercolors! Love using watercolor! You made it look so easy! Thanks Michelle! Beautiful Michelle. i love the thin grey panel in the first card and the background in the mermaid tag. Love the softness you achieved on the floral card, so pretty! Lovely cards - especially that pretty magnolia! Being from the South, I really love this Magnolia stamp. I love the soft colors of your flower. Beautiful card! What a lovely soft Magnolia you stamped and colored. You did such a lovely job! Lovely card. I appreciate how thorough, yet brief your video was. 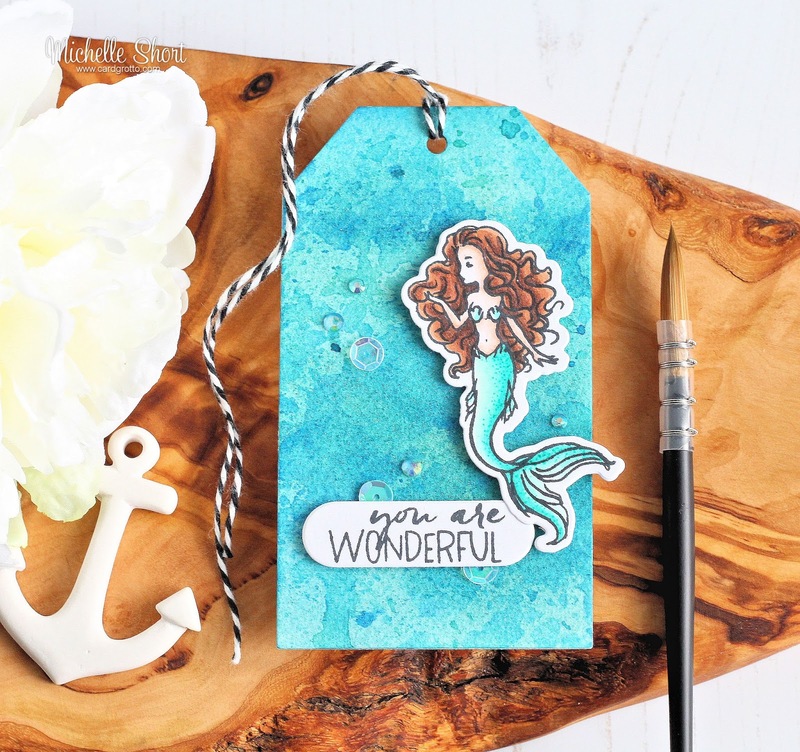 Beautiful card and mermaid tag! Love the soft gray wood grain border, lovely touch. I love the texture you achieved on your tag! And your flower is just beautiful!!! Both made great projects, TFS! Your creations are simply lovely ! Great card & tag!! I would really love playing with some of those water colors! Absolutely love the soft painting on that card, gorgeous! Love your mermaid tag. The background texture is amazing. Your watercoloured magnolia is very pretty. Wow the first card is a stunner! The tag is also lovely! I'm amazed at the soft color you were able to get with the watercolors on your flower card. It's very delicate looking! I love your mermaid tag, as well! That's a cute stamp set. Beautiful card and tag! Love the background on the tag. The colour is so rich and the layers and splatters add so much interest. And that magnolia stamp is gorgeous! Your watercolouring of it is wonderful. Just a soft hint of colour. Beautiful card and Tag..Love the soft colours in the flower. Beautiful watercoloring! Love the new catalog! Thanks to all! I am falling in love with that magnolia stamp! Thank You! What a pretty card and a nice tag! That magnolia is so darn pretty. I really like your mermaid and background too. It was nice to show two ways to use the watercolors. Wonderful soft watercoloring. Beautiful card. Love how these new watercolors can be used. Beautiful projects! I love the subtle colours for the flower! Beautiful cards, especially love the mermaid one.